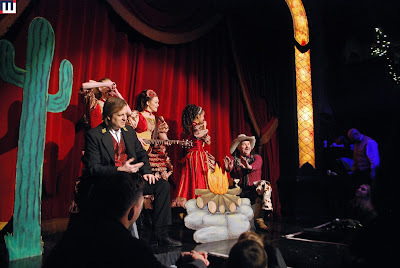 Today we are going to look at some of the secondary show that are playing during An Old Time Christmas at Silver Dollar City. In the Silver Dollar Saloon is this year's edition of Frontier Fa-La-La-La-La-Follies. They even used the balcony in the show. Who's ready for some crowd interaction? They pick a poor guy to come on stage and he gets to "tap dance" with the help of some bubble wrap. Campfire Christmas Stories with Choctaw Charlie is back with a new story. We got to sing some awesome campfire songs like "My Goat Knows the Bowling Scores"
Finally we get to the story of Sagebrush Scrooge. The poor victim gets a blizzard. This year's edition of the show is a lot of fun and definitely worth watching. The Living Nativity is back for another year in the Riverfront Playhouse. This is a musical telling of the birth of Jesus Christ. The Wise Men meeting with King Harrod. Presenting the gifts to baby Jesus. The final manger scene with all of the characters. At the Boatworks Theatre is Tinker Junior's Toy Shop. Be warned that this show is geared for children. If you are an adult, this is NOT the show for you. Honestly it's horrible. This is a fun show that brings the flavors of the Bayou to the holidays. This group really has a good time. The guy playing the washboard is really getting into it. If you have a chance, duck in and watch some of this show. The infectious energy of the group is hard to pass up. Final show for the festival is Christmas on Main Street - a light and sound spectacular. Featuring a Christmas tree of dancing Christmas lights accompanied by lights on the buildings and other trees, it is a great way to cap off the evening.